I have good news for everyone. The government has found enough money in a secret account to activate NORAD on Christmas eve so they can track Santa Clause on his annual trip around the world. Because of NORAD's "old school" technology the North Koreans and far lefties in the US will not be able to jamb the system with the intent of taking the fun of Christmas away from children. So Merry Christmas to everyone! Christmas is for us older kids also! The best Christmas story I remember was at Pierre Trudeau's funeral, when his son told of his father taking him to a northern Canadian Air base and letting him look through the window to see Santa loading his sleigh. He said that he know how important his father's job was to have access to such secrets. Oh just to note that the last comment was not a thread drift, as I recall, the airbase was also a DEW Line site, the fore runner of NORAD. Gus I remember the DEW line..
For the younger folks who may not have heard of it. Link to the Santa tracker website is below. If I remember correctly, the only time there was no national debt was for a brief period during the Jackson administration. Steve, wasn't the budget in the black during the second Bush admin. just prior to 9/11? Seems to me it was and then it all went south after we went to war with Iraq. I may be wrong. And the Debt just keeps getting worse and worse. I guess we need to print some more funny money. Tim, Budget in the black and no dept are two different things. The Clinton Administration managed to spend the same amount that was taken in by selling off most of the military hardware, that is the reason that we were so poorly equipped att eh beginning of the Second Gulf War. But there was still outstanding debt from WWII, the Korean War, The Viet Nam War and the First Gulf War. It is like saying that you are living with in your means by not spending more than you earn in a year, but you still have a mortgage on the house, you may have a balanced budget if you are making your mortgage payments, but until it is paid off, you are still in debt. Most of the Reduction in Force was done under Bush 41, as dividend to the end of the cold war. Cold war armaments have little to do with what was needed in Iraq. Indeed, our military is always well equipped to fight the last war, not the next one. How many hours did the F-22 fly over Iraq? That was a $Trillion CONgressional pork program, as is the F-35 $1.5 Trillion program. Where's the enemy requiring a manned fighter? We're using F-16 against ISIS. 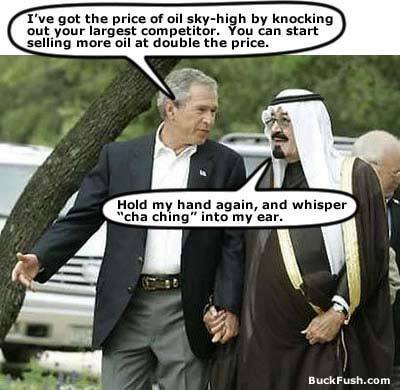 W squandered the balanced budget with an illegal and immoral war to destroy Iraq. The majority of Iraq is Shia, and allied with Iran. Most of the rest is ISIS. Thankfully, we are now supporting an independent Kurdistan, finally. Gus, are you in the bidding for a war surplus Humvee? The mil is selling 4,000 of 'em at $10K starting bid. They're for off-road use only. At least the bids start a little higher than during the Clinton administration. I met a fellow who wanted to bind on the Humvees that were sold in the 90s, but the crime bosses had control of the auctions, and bidders were informed that it would be in their own best interest health wise if they did not bid on surplus items. And Yes, Bush did reduce the atomic arsenal, but it was Clinton that dismantled the US Army, making it necessary for the National Guard to handle the bulk of the fighting. I agree that we should have never gone into Iraq, but with the evidence of WMDs and the serine attack on the UK it became a target for more than just the US. It is interesting to notice how the media says that there were no WMDs in Iraq, but now a cooking pot and fireworks are a WMD. The fact is, there was a large amount of WMDs in Iraq, but US standards, chemical and biological agents are WMDs and there was a lot of protective gear found (that is a component of chemical and biological weapons) But the real kicker is that the media could never understand how Syria managed to accumulate the largest stockpile of poison gas weapons in the world, while Iraq's stock pile had to be hidden some where. NORAD tracking Santa to WMD's. You guys are unbelievable! Russia supplied Syria with gas. We supplied Iraq, during the 1984-8 Iraq-Iran war. And it was old and unstable by 2003. Remember Condi's warning that first evidence of Iraq WMD could be a mushroom cloud? Aluminum tubes were cited as evidence of their activities. Look how many years and how much equipment it has taken Iran to approach having a nuke. I saw today where our government has 5 million to give to anyone willing to offer up some guy we already had at Gitmo, but turned loose.